Did you know the first Christian playwright was a woman? Hrotsvit (sometimes spelled Hrotsvita or Hrotsvitha) of Gandersheim (970—1002) was a canoness who lived in Gandersheim Abbey during the late tenth century. 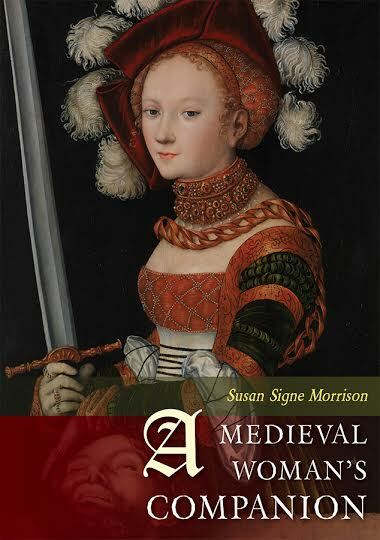 She wrote about many things: comedy, horror, battles, virgin martyrs, and holy prostitutes! Are you a fan of Hrotsvitha? So are they! Activists want her plays performed. This is the story of Constance, the daughter of Constantine, who outwits Gallicanus, a commander in her father’s army, who refuses to fight another battle until he marries Constance. However, Constance has other plans. She tells Gallicanus she will only marry him, but only if he takes two of her Christian servants: John and Paul. Meanwhile, she converts both of Gallicanus’s daughters while he’s away. During the battle, Gallicanus is facing defeat and death. John and Paul say that the only way for him to survive is to convert to Christianity. He does so and wins the war, much to Constance’s chagrin. Gallicanus returns victorious. When he reaches Constance, he tells her that she is released from her promise so that he can live chastely as a Christian. And they all lived happily ever after—except John and Paul, who are executed. This is the story of the martyrdom of three sisters—Agape, Chionia, and Irena, the youngest —and the evil Governor Dulcitius who pursues them. Because of their beauty, he declares that they should be wedded to the highest court in the land, but first they have to show their allegiance to Rome by making a sacrifice. When he can’t convince the sisters to do so, he throws them in the dungeon. While they are in prison, Dulcitius tries to seduce them. But by some miracle, he breaks into a broom closet and ravages the pots and pans, covering himself in soot. When his soldiers find him, they think he is the Devil and run away. In a rage, Dulcitius orders the sisters to be stripped and exposed in public. But, again, they are protected. The sisters endure many other trials, until they are finally martyred. In this story, Drusiana’s admirer Callimachus declares his love for her, but she is disgusted by him. Rather than succumb to his wiles, she prays for death and dies. However, this does not stop Callimachus, who becomes even more entranced by her, even though she is laid in a tomb and guarded by Fortunatus. Callimachus finally bribes Fortunatus to let him see her body again. Fortunatus agrees lasciviously. As they enter the tomb, Fortunatus is killed by a monstrous serpent. Callimachus is not attacked by the serpent; he explains that he had no impure intention. He converts to Christianity, and God resurrects Drusiana. She prays for Fortunatus’s resurrection, which is granted. Fortunatus rises, but he is disgusted with what he finds: Callimachus, a Christian?! Seeing this holy spectacle, he immediately rejects life and chooses death. This story begins with Mary being told by her uncle Ephrem that it would be a shame if she chose the “low pleasures of the earth.” He tells her that if she chooses so, she can be as the angels so that when at last she casts off the burden of this mortal body, they will be near her (74). She agrees to do so, and in order to ensure that she keeps her promise, her father Abraham builds her a cell and locks her away. After some time, when Mary is twenty years old, she falls in love with a mysterious man dressed in a monk’s habit and decides to leave the hermitage with him. Once Mary leaves the hermitage, she feels guilty—so guilty that she decides to plunge headfirst into sin and become a harlot. Two years later, Abraham goes after her: he disguises himself as a lover and meets her at the brothel. When Abraham enters the brothel, we find that apparently Lady Mary is quite happy in her new life (83). However, when Mary recognizes her father, she feels ashamed. Not wanting to disobey her father, she returns with him, which pleases him very much. He locks her in the cell again for twenty years of penance. The story ends with Abraham talking to Ephrem. They discuss Mary, remarking on how well she is repenting, and then they congratulate themselves on a job well done. They praise God, and the play ends. Why does Mary become a hermit? Does Mary enjoy her life outside of the hermitage? And if so, why? Why does she decide to return? Why does the story, which centers around Mary, end with only Abraham talking to Ephrem, and not Mary? While this story is called Pafnutius, it may actually be the story of Thais. Paphnutius is a hermit who, while teaching a lesson one day, hears from one of his Disciples about a prostitute named Thais, who lives nearby in a brothel. Her beauty is legendary and unparalleled, so much so that men fight over her constantly. She is so frightened, that eventually she repents. “And what zest for pleasure do you think is left now in a heart suddenly awakened to a consciousness of guilt! Remorse has killed everything” (109). Defeated, she agrees to destroy her wealth and leave her many Lovers. She returns with Paphnutitus, who walls her into a cell (much like Mary) to protect her from any of the men who might still chase her. Eventually, Thais is forgiven of all her sins and released from her cell. Very shortly after her release, she dies. Why is no blamed assigned to Thais’s lovers? Surely, they are as guilty as she is. Is Pafnutius’s treatment of Thais justified? “Tell me your children’s names,” demands Hadrian. Charity has diminished evenly even number of years; Hope a number also diminished, but evenly uneven; and Faith an augmented number, unevenly even…. Charity has now completed two olympiads, Hope two llustres, and Faith three olympiads. If 8 is two olympiads; 10 is two lustres; a number is “diminished” when the parts of it give a sum that is less than the original number (for instance, 8); an “evenly even” number can be divided into two equal parts; An “evenly uneven” number can be divided into an even amount of odd numbers. “Unevenly even” numbers are able to be divided, but not down to indivisible unity: the number one; how old are Faith, Hope, and Charity? Hadrian ponders this for a moment and decides to sentence them all to death. The children all bravely endure all of the gruesome tortures: beatings, burnings, and finally they are executed with a sword. Sapientia, along with several matrons, bury the children fie miles outside the city of Rome. Forty days later, as Sapientia is praying at the grave of her daughters, she dies and enters Heaven. Why is this story the only one named after a woman? What’s different about it? How old are they children? Have you ever heard of Hrotsvitha’s plays? Possibly. Have you ever seen Hrotsvitha’s plays? Probably not. Several scholars have noted that Hrotsvitha’s plays are not as widely produced as they should be.